IMPORTANT: a 1000 watt inverter will not be able to handle 750 watts of output for an extended period of time, because power surges can jolt output up three to five times higher (750 watts x 3 = 2250 watts). ***FOR AIR CONDITIONERS AND COMPRESSORS: Multiply your wattage by five (or more) if you’re running something like an air compressor or air conditioner, which bases its output off of the locked rotor startup or locked rotor amperage (LRA). A standard modified sine high frequency inverter can only withstand surges for 30-40 milliseconds, which is why AIMS Power provides customers with top-of-the-line pure sine low frequency inverters that can handle 300% startup surges for up to 20 seconds, as you see when running air conditioners and compressors. The difference between modified sine waves (red) and pure sine waves (blue). 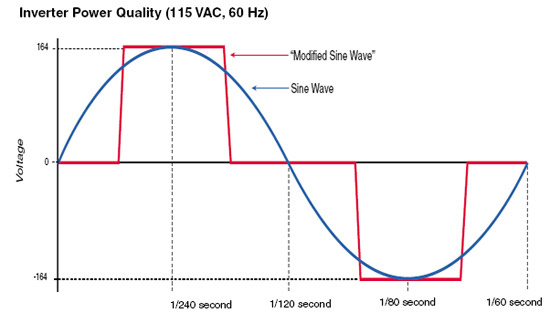 Modified sine high frequency inverters still have plenty of applications, but it’s important to know when to make the step up to pure sine technology. If you have questions about which AIMS Power inverters and accessories are correct for your application, email techsupport@aimscorp.net so we can help. AIMS will get the job done no matter how much power it requires. This entry was posted in Inverter FAQ, Tech Tip of the Week and tagged AIMS Power, Inverter, Low Frequency Inverter, Modified Sine Wave, Power Inverter, Pure Sine Wave by Eric Lee Castillo. Bookmark the permalink.